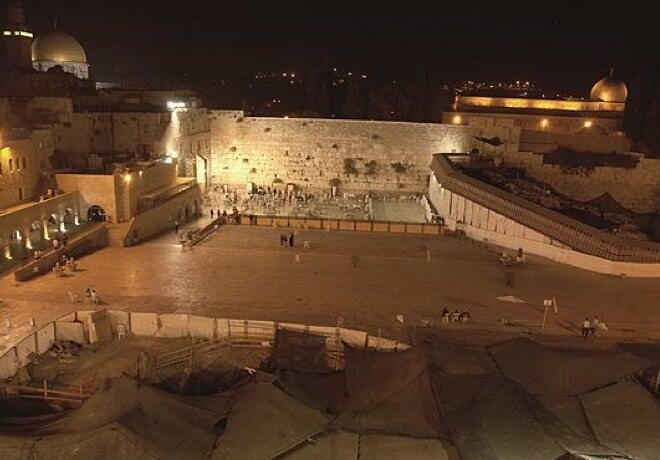 Many Jerusalem sites are at their most beautifult when seen at nightfall. The peacefulness, the nice weather (according to the season), the special lightning (or darkness) and of course the atmosphere, all of these makes Jerusalem even more special at night. There’s no doubt that the most beautiful, impressing and glorious view in Israel is the spectacular panoramic view over the Mount of Olives. East or West, religious or secular – it is all seen from the roof of Jerusalem. At night, we can see an interesting, though an entirely different angle. 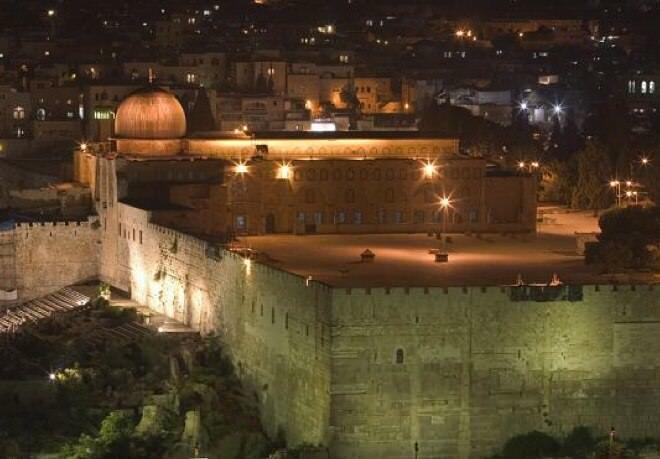 The Temple Mount is illuminated with all its beautiful buildings, as well as the ancient Jewish cemetery located at the foot of the mountain. The Eastern wall of the Temple Mount, and the Golden Gate in its center, look spectacular, standing proud. The Holy Sepulchre, Holy Mount Zion and even the King David hotel and the YMCA tower behind it – are all visible from here. There’s more than enough place to sit comfortably, hours can be spent here while watching over the Holy City. The path to the observatory passes through the main road of Al-Tur neighborhood, but the ride is worth its outcome. To those who are still reluctant, you can settle for observation point of the city, located under the Hebrew University campus on Mount Scopus. 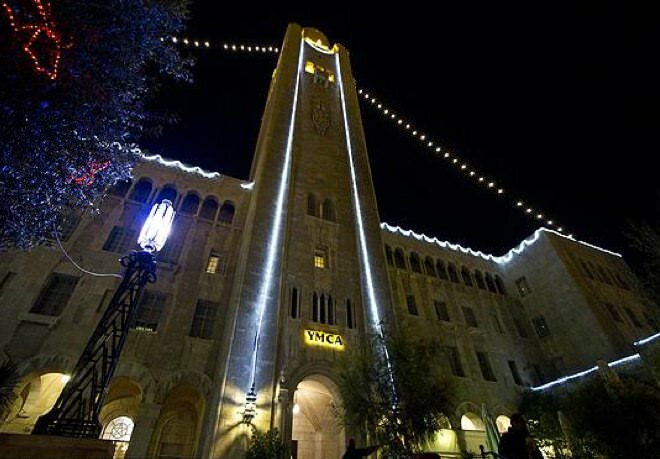 Visiting the lighted YMCA tower at night can be an exhilarating experience: the imposing façade, the Madaba mosaic map at the hotel entrance, and of course – the lobby's ceiling that cannot be missed. If you ask nicely, the guard might agree to open the entrance to the upper part of the tower (at the cost of 5 NIS) especially for you, so you can see Jerusalem through a 360 degrees panoramic view. From the YMCA you can cross the road and go around the Kind David Hotel from the South and up to Mishkenot Sha'ananim. You may walk on the pavement of King David Street, but the romantics among you can circle the Hotel through the gas station located North of it, and then turn south to Mishkenot Sha'ananim, to the green and fresh grass of the Bloomfield Garden. The view of the Old City will do all the work for you. 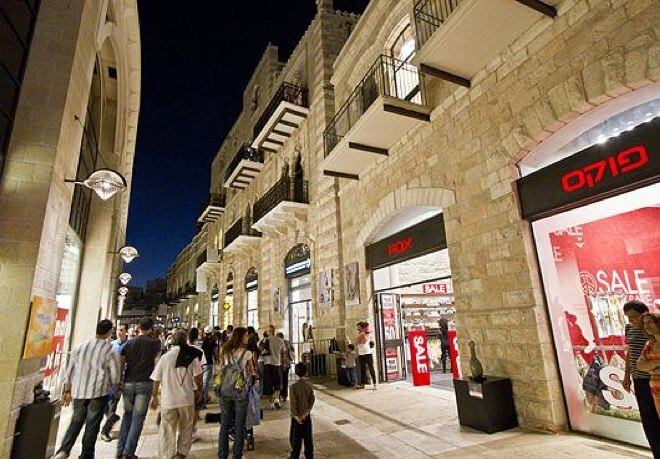 The promenade in the South side of town is a night attraction for Jerusalemites, tourists and hopeless romantics. Take a hot thermos, pick the most deserted bench on the promenade, or a piece of grass, and just sit and watch the city that was re-united. You may continue to walk the boulevard to the North-West, until you reach the entrance to Abu Tor neighborhood. The walk will reveal new views of the Old City and of the Mount of Olives. It is much recommended to take a deep breath with the fresh Jerusalem air. The Old City is full of sites that cannot be passed up during your nightly tour. Here is the route we recommend. Starting from the Mount Zion parking lot, walk from Zion Gate South until Dormition Abbey and the Tomb of David: the architecture and history are most visible at night. Climb the stairs of David's Tomb and look around: South to Armon HaNatziv, East and North to the Mount of Olives and the Old City, and West to the King David Hotel and the YMCA building. Next, continue walking near Dormition Abbey to the West, until you a the beautiful view of west Jerusalem is revealed to you, under the South-West corner of the walls: the Valley of Hinnom, Sultan’s Pool, Mishkanot Sha’ananim, and more. Keep going North on the path until you reach Jaffa Gate. On your left lies Sultan’s Pool and Kfar David neighborhood (formerly Mamilla). Before going through the Jaffa Gate, take a look at the magnificent Tower of David. In 100 meters you’ll be able to have an ice cream or a bagel with hyssop. From Jaffa Gate, walk to the Old City towards the Jewish Quarter and the roofs of the Old City. Keep going through the quarter until the observation of the Western Wall from above, and finish your journey there. For those of you who want to feel closer to God, go from the Western Wall to the South-East corner of Temple Mount (2 minutes' walk). Raise your head to the most impressing spot of the Temple Mount, the joint between the two high walls. Don’t feel afraid if you get dizzy from the size and the intensity of the lighted stones. Cross the road to look at the lighted Mount of Olives. Right next to the South-Eastern corner of the Temple Mount, you will be able to sit at the little lookout point, above the Kidron Valley tombs (which aren’t lighted these days, unfortunately). Further north, keep walking on the pavement, and you will be able to see the front of Gethsemane church, lighted most gloriously, as well as the Church of Maria Magdalene (known by the people as the Onion Dome) above it. Some may say that there is no night life in Jerusalem. There is this famous joke, claiming that the busiest place in Jerusalem at night – is the road to Tel Aviv. But that’s not true. The cafes and restaurants on Emek Refaim street and German Colony, the Alrov Mamilla Boulevard, the Jerusalem mix at Machane Yehuda and Nahlaot, Keren ha-Yesod Street and many more, are all full of life at night (and part of them even on Saturdays). There are a lot of options, for both those who keep kosher, and those who do not. Sometimes it’s even hard to choose. The distance between the City Center to Mishkanot Sha’ananim is just a few minutes' walk. 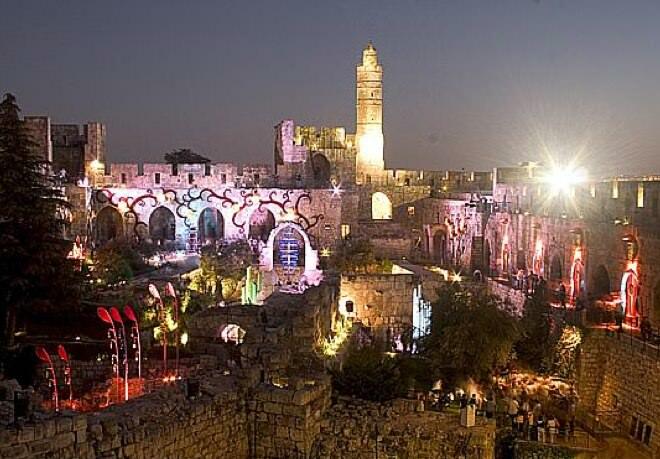 Don't miss out on this spectacular feature of Jerusalem, and go on a night's walk.